Electrical impedance is a complicated and often misunderstood concept. I will not pretend that I understand all the complex interactions that exist an electrical circuit. In the interest of grossly oversimplifying how to define electrical impedance, it is essentially resistance. Why am I bringing all of this up, you ask? Excellent question and thank you for asking. In this review I will discuss experiments with the relationship between a microphone’s output impedance and a preamp’s input impedance. By experimenting with different impedance values at this stage in your signal chain, you can get some interesting results. 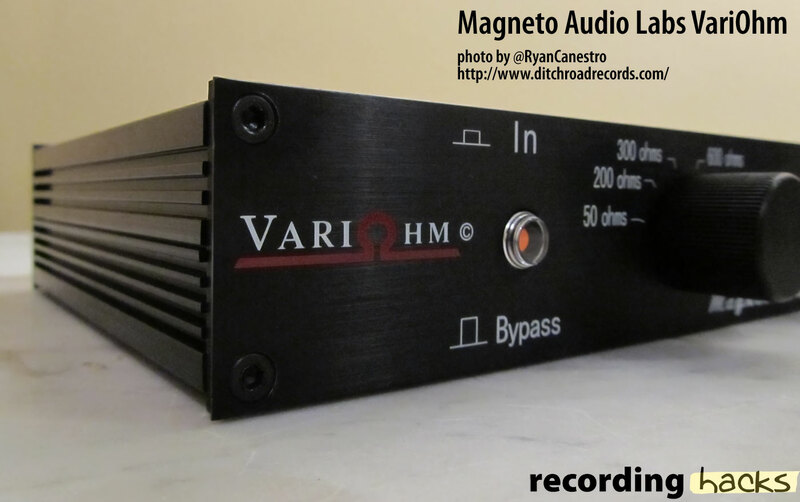 To greatly ease the pursuit of my impedance curiosities, enter Magneto Labs’ VariOhm. This box is one of those great ideas that have been used in top studios for decades, but never put into a package easily accessible for the rest of us. 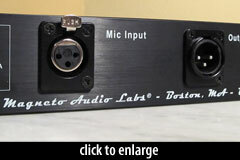 What it does do it allow you to easily change the impedance relationship between your microphone and preamp. 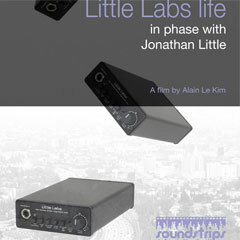 The impedance relationship between a microphone and preamp affects sound greatly. Different mics and preamps have a range of impedance values that contribute to sonic texture. It can affect warmth, sizzle, clarity, grit and many other aspects of sound. 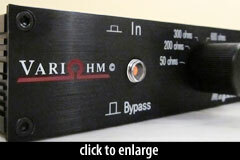 By inserting the VariOhm between the mic and the preamp, you now control this important relationship. Impedance values can be matched for maximum output or altered for additional tone settings for all kinds of microphones. The Variohm is a completely passive, transformer-based device. Connect a microphone via the female XLR jack, and the preamp via the male XLR jack. On the front panel is a six-way selector knob for input impedance: 50Ω, 200Ω, 300Ω, 500Ω, 1.2kΩ, 2.4kΩ. Additional switches on the front panel provide bypass, phantom power (on/off), and phase. The unit fits into a half rack space. 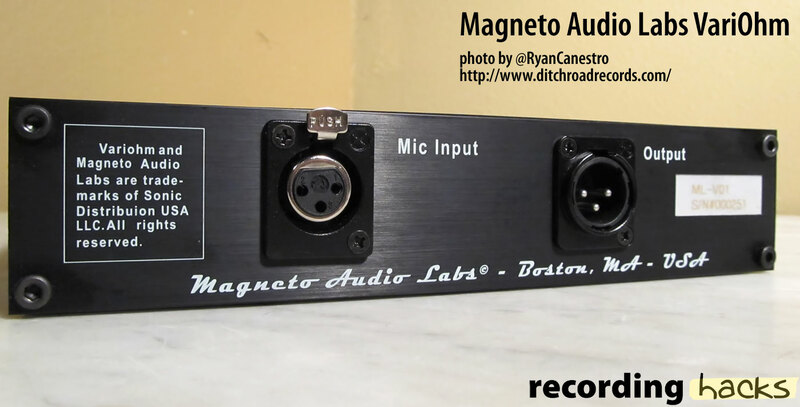 Why would you want to chance the impedance relationship between a microphone and a preamp? The answer is simple. Some gear simply sounds better at different impedance loads. Vintage gear and older designs such as the Shure SM57 were designed to work with mixers of the mid 60’s. The common impedance values of these preamps was closer to 600Ω, while commonplace values in modern studio preamps is more likely 2,500Ω. 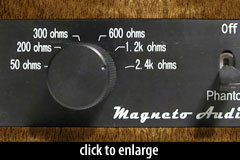 Some of the “clean” modern preamp designs exceed 8000Ω. We do not need to do any complicated math to realize that there is a definite difference in these figures. A microphone that sounds considerably better through a vintage preamp may have less to do with the particular preamp than it does with impedance loading. I have read extensively on this topic and I have yet to see anyone agree about what the actual factors involved are that actually make tonal differences. Some say that the resonant frequencies of the microphone’s diaphragms can be changed by impedance load. Others mention the diaphragm being dampened in different ways at different loads. Whatever the truth is, things change and stuff happens when you alter the load. What I have noticed, as a broad over-generalization, is that my dynamic microphones (moving coil and ribbon) sound more open and have a silkier top end when the preamp input level is between 300 and 600 Ohms. The condenser microphones seem to be a bit happier in the several thousand Ohm range. One one of my preamps has an impedance switch that will toggle between 1200 and 300 Ohms. When I use my Shure SM7b, the 300Ω setting is the clear winner as far as overall tone is concerned. My condenser microphones seem to prefer the 1200Ω setting. Now let’s get down to some examples from my tests and the The Home Recording Show podcast segment about impedance. I used two microphones on two sources: the Shure SM57 and the Shure KSM32. The sources are a guitar amp and a cymbal. The guitar examples are very mid-heavy. The cymbal is obviously more focused on the high end. The first track contains a sequence of six cymbal strikes, with the VariOhm set to 50Ω, 200Ω, 300Ω, 600Ω, 1200Ω, and 2400Ω (one strike apiece), as recorded by a Shure KSM32 condenser (output impedance: 150Ω) through the VariOhm and into a Focusrite Octopre. There might have been some variation in the volume of each strike, but some of the volume change you hear is due to the loading of the microphone. Below you can hear a short electric guitar track, reamped and recorded by a Shure SM7B (output impedance: 150Ω), through the VariOhm, into a Focusrite Octopre. From top to bottom, you’ll hear the VariOhm: bypassed, 50Ω, 200Ω, 300Ω, 600Ω, 1200Ω, and 2400Ω. When the VariOhm is bypassed, the mic sees the input impedance of the pre, which in this case is 2800Ω. In conclusion, the differences are subtle. But the changes are certainly audible, and are different in ways that an other processing would not necessarily deliver. The VariOhm makes it very easy to select different values and audition them against the direct signal. At a price that is far below almost any other quality piece of gear you can add to your rack, why not have this additional tone-shaping tool?! I am a huge proponent of getting sounds at the source. If you can capture a great performance in a good room with a solid signal chain most of the battle has already been won. To be able to add one more item to the toolkit during basic tracking is another puzzle piece in the sum of all parts to make the best recording possible. The condenser mic changes in tone similar to the dynamic, but changes are less pronounced, with a slight mid shift overall. Ryan Canestro is a musician, engineer, and producer. He co-hosts the popular Home Recording Show podcast, and operates a Simi Valley recording studio called Ditch Road Records. I’d be curious to know how many dynamic mics (ribbon & moving coils) you tested with this unit and which ones? IMHO, the 300 is the best one. Interesting. But from this rough test, it sounds like the rule of thumb about impedance matching is correct. 10 times greater *or higher* is a perfectly good spot to aim for. And once you get in that ballpark, there isn’t much difference. For me, 600 ohms and up all sound fine (with the cymbal, the last strike sounded best), while the lower values are only good for the “let’s pretend we’re listening to a really crappy radio” sound some engineers seem to love using in song intros or breaks these days. If you just want to capture what’s there, it sounds like the way most mics and preamps are designed in the modern world will work just fine.